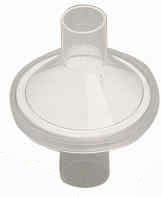 This high performance filter may be used as a disposable substitute for our number 3490/3492 reusable filters. It features a multi-layer, naturally hydrophobic and electrostatically charged filter media. The media is integrated into a clear, compact, lightweight filter housing for optimum flow dispersion and utilization of filter surface area. MQ 30301 Includes 6 inches of 22 mm ID tubing on one side and an adapter on the other side to make it a 22 mm OD connection.